Ladd and Charles Dow, a father and son, came to Douglas County, Kansas in 1855 from Ohio. 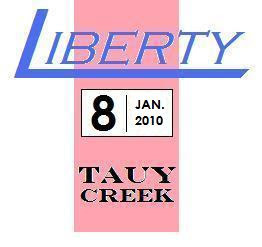 They settled in an area known as Hickory Point, now called Stony Point, in Palmyra Township. Charles Dow boarded with a man named Jacob Branson, whose land was adjacent to Ladd's. Charles would unfortunately become the first murder victim in Kansas and his murder would trigger the Wakarusa War, the sacking of Lawrence, the Pottawatomie massacre and the Battle of Black Jack. Franklin Coleman, a nearby settler who apparently only became pro-slavery after coming to Kansas, was caught by Charles cutting wood on his land claim with another man. Dow asked Coleman to leave but Coleman refused. Dow then went to Branson's house and asked Branson to accompany him back to where Coleman was still chopping wood. Branson grabbed his gun but when they got to the spot, Coleman was gone but the other man remained. They spoke for awhile and Branson returned home while Dow headed to the blacksmith shop. While at the blacksmith shop, Dow was threatened by a companion of Coleman's but Dow was able to dissuade him from doing anything rash. Dow passed by Coleman's house and Coleman came out and shot at him but missed. As Dow turned around at the sound of the gun shot, Coleman fired again shooting Dow in the head, killing him instantly. Dow was buried on his land in an unmarked grave and search commenced for his murderer. 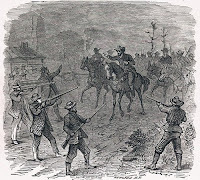 Coleman ran off to Shawnee Mission where he surrendered to Territorial Governor Shannon and was placed into custody and brought to Lecompton, the territorial capital. Coleman, while in Lawrence, then accused Branson of being a conspirator and Sheriff Samuel Jones rounded up a posse and arrested him. A group of men, who happened to be investigating the circumstances of the Dow murder learned of this and rode off to find Sheriff Jones and Branson. After a brief stand-off, Branson was freed but Sheriff Jones vowed revenge. Francis Coleman was never charged with Dow's murder and actually participated in the Battle of Black Jack in 1856 and was later linked to another free-state murder. The area where Dow was buried would continue to be used as a cemetery, possibly containing 75 burials, until 1873 when Stony Point Cemetery was established. Ladd Dow was buried in Stony Point Cemetery until he and Charles was reinterred in Baldwin City's Oakwood Cemetery. Text taken from Wikipedia, "A Self-Guided Tour of Baldwin City's Historic Sites" by Loren K. Litteer (1997) and kansasmemory.org. Photos: Dow Cemetery by author; "Rescue of Branson" by J.N. 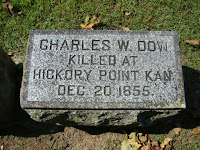 Halloway (1855) from kansasmemory.org; Charles Dow gravestone from Find-a-Grave. *Note: The tombstone for Dow is incorrect, Dow was killed on November 21, 1855. Also, the Find-a-Grave page is incorrect in saying that Dow was killed in the Battle of Black Jack. Dow died months before the battle began on June 2, 1856.